Fire-King for Sunbeam Milk Glass Large Mixing Bowl .. 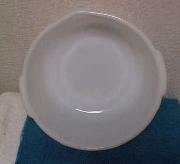 This is a large milk glass mixing bowl by Fire-King Ware for Sunbeam. This bowl measures approx. 9 1/2 " across and about 5 " deep. The bowl has a small pouring spout and two small handles. . Holds 3 1/2 quarts fills it to the rim, so I am assuming this would be considered a 3 QT bowl. There is what appears to be a number "18" on the bottom.This bowl is marked on the bottom..one defect on the side of bowl looks like a scratch..There are no chips or cracks In good used condition..
PRICE: $17.99 plus $1.50 special handling charge.